Umm, well, I'm not much on pictures so I'll illustrate in words. My Junior and Senior years at Rice University, I worked on the founding committee for Martel College, one of Rice's nine (soon to be eleven) residential colleges. I had dabbled in college activities as a freshman at Baker, but the chance to set up a new college, new student government, new bike racing, theatre, and game rooms really got me excited. I was derided from the start as "a traitor" and told that the college would be populated by a bunch of idealists and malcontents who didn't like the colleges they started at. But, things started coming together early on; the first elected President of the college might as well have been Laura Roslin from the Battlestar Galactica--just superb. I pulled a lot behind the scenes and eventually got elected the first Prime Minister of the college--a position that me and a former rival had worked very hard to create. I got a set of eight matching racing bikes (in college colors), recruited a troop of boy scouts to help build a new stage set to go with the brand-new theatre lights that came with the furnishings, and a nice game room all put together pretty much by the first day they finally let us actually live in the college (a tropical depression named Allison rudely dumped 24 inches of rain on Houston and flooded the city, delaying completion of the building until February 2002). A month later, we wowed the other colleges at the annual cycling race and rallied a lot of spirit despite being a hodgepodge of students from all the other colleges. I graduated under a cloud of scandal--in nine months I had overspent my appropriations by more than $3000. But, it needed to get done and Martel's next Parliament ran a tight ship. 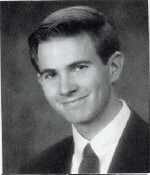 I went back in March 2004 and found the underclassmen knew who I was. In July 2007, I met a graduating "Marty" and we got to talking over beers. She mentioned she had served as Martel Prime Minister, but that she couldn't figure out what the position was for so she had come close to dissolving the office. As a graduate student, I did a lot of homebuilding for poor families in Tijuana. I also went on some wild 'n crazy ski trips. I got a Ph.D. in chemical simulations, which means I'm technically a very, very good liar. Now I'm a postdoc at Vanderbilt. I work on protein models, and generally try to keep the simulations community on its toes. I can get up in the morning, think about what might be interesting to try, and pretty much just do it for the rest of the day. In that sense, it's a pretty good life. David Cerutti has a birthday today. Me and the Martel College Founding Committee, March 2001. The one OK photo I could find of Martel. 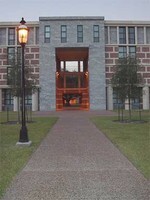 This is the "Sallyport" reflecting the university's main entrance. Granite in the slabs is supposedly taken from the same quarry, but who knows. The building and other nearby structures was designed by Michael Graves--honored by President Clinton and also the designer of a bunch of Target brand kitchen accessories. As a prank one of the neighboring colleges created a 20-foot long "receipt" saying "Thank you for shopping at Target." Here's a picture of one of the proteins I'm working on. It has lots of atoms. They move around.